WideBand products are made in the USA to the highest quality standards and possess a uniquely robust signal that allows full Gigabit bandwidth even on less than perfect installs of Category 5 and 5e cabling. WideBand can deliver Gigabit connections up to 200 meters on Category 5 cable and 100 meters over Category 3 cable. Most Gigabit Ethernet products require optimum wiring environments with Category 5e or higher. While these products often still connect in less than perfect environments, the result is a number of retransmissions. 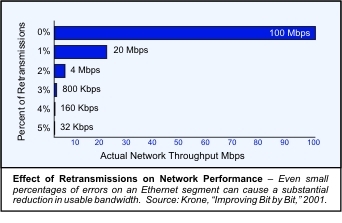 Just a 1% retransmission rate reduces the bandwidth by 80% (see chart). WideBand products are WGNA Certified to work on all types of Category 5 at 100 meters with less than 1 bit per million error rate. This means the full Gigabit of bandwidth can be delivered Without Rewiring.